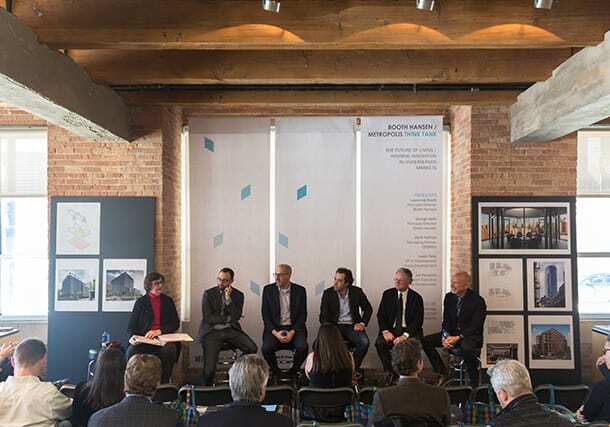 Booth Hansen had the honor of hosting Metropolis Magazine for their Chicago Think Tank series. Our discussion topic was “The Future of Living: Housing Innovation in Underserved Markets.” We assembled a panel of experts from different building industry sectors to bring their perspectives to the table and challenge us to think about how we can bring innovation to the multi-family market. The discussion was moderated by Metropolis’ editor in chief, Susan Szenasy, and the panelists were Larry Booth and George Halik of Booth Hansen, Mark Heffron of CEDARst, Justin Pelej of Focus Development, and Joe Pecoraro of Skender Construction.